Campbell Scientific dataloggers are often found at the heart of remote wind assessment systems because they are so dependable. Wind assessment systems typically monitor wind speeds at several heights, producing a profile of wind data. Two new products make our dataloggers even better for monitoring wind: the Campbell Scientific LLAC4 4- Channel Low Level AC Conversion Module, and the IsoTruss 82 Meter Ice Rated Tilt Up Tower. Anemometers such as the NRG Maximum #40 or the RM Young 05103 Wind Monitor are the sensors of choice for wind profiling at heights below 100 meters. These sensors produce a low level ac signal in which the frequency is proportional to the speed of rotation. The CR1000's two pulse channels can read this signal directly. However, the LLAC4 converts the ac signal to a 0 to 5 V square wave that can be measured on the CR1000's eight control ports. Thus, the CR1000 can monitor up to 10 wind profiling sensors, using its pulse channels, control ports, and two LLAC4s. For less demanding wind assessment systems, CR200-series dataloggers can be equipped with an LLAC4 to monitor up to four wind speed sensors. The CR200-series datalogger can also operate as a wireless sensor. The CR205 resides at the height of each wind sensor and becomes a self-contained measurement system. CR205s at each wind monitoring height report their data to a CR1000 at the base of the tower. 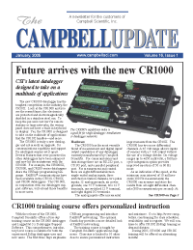 The CR1000 uses one of our telecommunications options to transmit data to a PC. IsoTruss has developed a composite fiber, guyed, tilt-up tower that can reach 82 meters or higher. Campbell Scientific has teamed up with IsoTruss to offer rugged wind profiling systems, including towers, mounts, sensors, dataloggers, and telecommunications equipment.